Comfrey (Comarum palustre extract) has analgesic and anti-inflammatory properties. It has a strong regenerating effect on joint tissue and helps in the treatment of rheumatic diseases. Comfrey has anti-inflammatory, analgesic and local anesthetic effects. 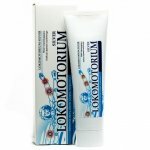 has anti-rheumatic, anti-inflammatory and anti-swelling properties. Musculoskeletal system diseases (degenerative changes, rheumatoid arthritis, radiculitis, etc.). Apply on affected areas with gentle massage and leave it on till the skin absorbs it completely. Use 2-3 times daily from 2 weeks to 6 months. or according to the instruction of the physician or the pharmacist. Aqua, Petrolatum, Glycerin, Glyceryl Monostearate, Corn Oil, Comarum Palustre Extract, Symphytum Officinale Leaf Extract, Cetearyl Alcohol, Ceteareth-20, Isopropyl Myristate, Ginkgo Biloba Leaf Extract, Triceteareth-4 phosphate, Carbopol, Triethanolamine, PEG-40 Hydrogenated Castor Oil, Abies Sibirica Oil, Bishofit, Methylparaben, Propylparaben, 2-Bromo-2-nitropropane-1,3-diol. Contraindications: hypersensitivity of the components. skin diseases.